Create with Gwen: New Annual Catalog Starts Today! New Annual Catalog Starts Today! As we celebrate 30 years, I look forward to sharing new creativity which starts with the New 2018-2019 Annual Catalog! Click the pic to download the catalog! Need one in your hands? (Of course, we all do!) Just contact me and I'll send you one! Check back soon for new stampin events here in my Create Happy Studio and Online! OK! I gotta run! Lots to do, plan, and create! ENJOY! 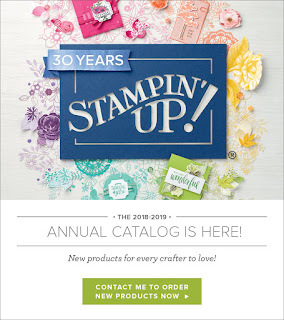 Oh, and a Reminder: New Stampin’ Blends colors will not be available until mid-June. AND a CASE for the New Stamparatus is coming too! More info soon! Happy Friday, Happy June, Happy Shopping! Contact me! I'll gladly support your Stampin' habit!